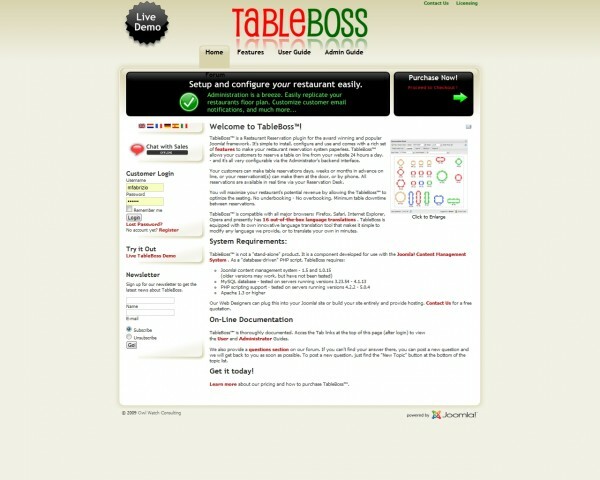 TableBoss is a Restaurant Reservation plugin for the award winning and popular Joomla! framework. Its simple to install, configure and use and comes with a rich set of features to make your restaurant reservation system paperless. TableBoss allows your customers to reserve a table on line from your website 24 hours a day. - and its all very configurable via the Administrators backend interface. Your customers can make table reservations days, weeks or months in advance on line, or your reservationist(s) can make them at the door, or by phone. All reservations are available in real time via your Reservation Desk. You will maximize your restaurants potential revenue by allowing the TableBoss to optimize the seating. No underbooking - No overbooking. Minimum table downtime between reservations. TableBoss is compatible with all major browsers: Firefox, Safari, Internet Explorer, Opera and presently has 13 out-of-the box language translations. TableBoss is equipped with its own innovative language translation tool that makes it simple to modify any language we provide, or to translate your own in minutes. Try a demo booking now.